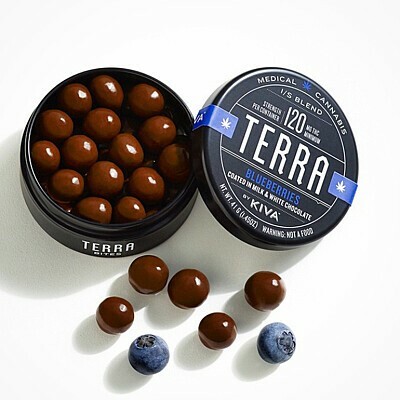 (120MG THC) (5MG THC Per Bite) Blueberry Terra Bites are the newest innovation in our line of best-selling Terra Bites. Using a traditional 24-hour panning process, dried US-grown blueberries are dusted with cocoa powder and finished with a generous coating of Kiva milk chocolate. Each 5MG bite is polished to sweet, tart, irresistible, perfection. Ingredients: Milk Chocolate (Sugar, Cocoa Butter, Milk, Unsweetened Chocolate, Soya Lecithin, Pure Vanilla), Dried Blueberries (Blueberries, Sucrose, Sunflower Oil), Cannabis Extract, Polish (Water, Gum Arabic, Sucrose, Corn Syrup), Natural Flavors, Citric Acid, Confectioner's Glaze, Cocoa Powder.